Get ready to take a chance on something that just might end up being the most profoundly impactful moment for humanity, for the history ... of history. The exciting adventure of the day we make contact with life beyond Earth comes to the screen with a profound sense of wonder and a dazzling visual sweep that extends to the outer reaches of space and the imagination. Jodie Foster is Astronomer Ellie Arroway, a woman of science. Matthew McConaughey is religious scholar Palmer Joss, a man of faith. They're opposite ends of a spectrum - and sudden players on the worldstage as the countdown to humanity's greatest journey begins. Powerfully, thrillingly and emotioally, Contact connects. $20.584 million on 1923 screens. Two years in a row, Warner Bros. won the Official Colin Jacobson Award for Most Inappropriately Revealing Film Trailer. In 1998, The Negotiator took the prize for its preview that gave away at least one big plot twist that should have remained a secret. 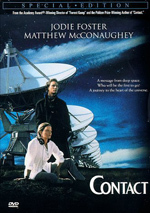 1997's award went to Contact, otherwise known as the movie that took two and a half hours to tell us what we already knew from a two and a half minute trailer. I actually saw Contact prior to its theatrical run. My then-girlfriend and I attended a preview showing of the film that took place about two weeks early. She was the motivating force behind our presence there, but she didn't have to drag me along. Bob Zemeckis has produced some terrific films so even though he faltered with Forrest Gump, I was more than willing to give him another shot. I also had a small personal interest in the film. Back when they were making it in 1996, some of the scenes were shot in Washington, D.C. As it so happens, I live in a suburb of Washington. Apparently they used the parking lot for the shopping center behind my apartment complex as the site from which they would bus extras. For a couple of weeks, I saw tons of cars in the normally empty lot and handwritten signs that simply read Contact. That kind of spooked me at first, until I finally found out that Contact was a film. Hey, I drove right past a sign that directed traffic for extras - you don't get brushes with Hollywood any bigger than that, right? As such, I just had to see this film. Of course, I'd seen the trailer for Contact a number of times during the months leading up to its release. 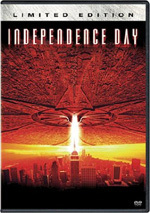 They made the film look fairly compelling, something like a more intellectual, less violent Independence Day. 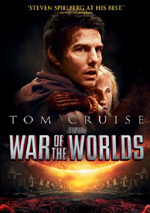 The preview gave the film the appearance of a dramatic, compelling "alien encounter" story. Little did I realize just how much of that story had been revealed during the trailer. For this 150-minute film, the trailer tells you pretty much everything that will happen for the first 120 minutes. We know there'll be a signal from aliens, we know Jodie Foster's character Ellie will receive it, we know it'll give blueprints for a spacecraft to enable us to visit them, we know there'll be some politicking about who gets to go, we know that Ellie eventually will be the astronaut in question. Really, all that's left to find out pertains to what happens when she meets the aliens - the trailer has told us virtually everything else. This fact really made the film a giant disappointment for me during that initial theatrical screening. Many scenes should have been suspenseful - what's in the message, who's going on the voyage, etc. - but they weren't because we already knew! All we were left with was what the ending of the film would be, and to say that Jodie's meeting with the aliens was a let-down is a major understatement. Many may argue that it doesn't matter that the trailer gave away so much of the film, that many movies are predictable and that what's important is how well the subject matter is executed. After all, when you watch a movie a second - or third, or whatever - time, you already know what's going to happen. You derive enjoyment from the execution of that story. And those arguments would be correct, but they don't change my point of view about Contact. Admittedly, I did like the film more the second time around, probably because I didn't have the same "that's all there is to it?" reaction from the first screening. Nonetheless, it still didn't do much for me. The greatest fault of this film revolves around its extremely extended running time. How they took two and a half hours to develop what the trailer neatly told in two and a half minutes is beyond me. Contact moves at an extremely slow pace and it really has trouble developing any kind of momentum. Had this film been half an hour shorter, it would have moved along at a much crisper pace and it would have been more interesting. As it is, it simply dawdles too much and makes the audience wait much too long to get to its point. Some would argue that I'm just an impatient MTV-weaned Mongoloid with no attention span and that the beauty of the film comes from its slow exposition and the way it develops its intellectual ideas. Well, they may be right about the Mongoloid thing, but I take exception at the concept that Contact possesses any great thinking or terrific philosophical ideas. 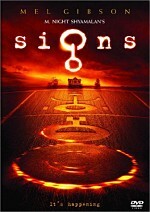 The filmmakers clearly thought they were doing some sort of exploration of the nature of beliefs, religious or otherwise - Zemeckis actually refers to the film as a "metaphor for belief" during his audio commentary - but in the end, the film amounts to little more than dime store philosophy. Whereas the filmmakers wanted to send a message that proposes that science and religion aren't mutually exclusive, I took a different notion away from the film. Throughout the entire film, Ellie is a person who unwaveringly requires proof. She's not one to take any leaps of faith based on unconfirmed beliefs. However, by the end, she has to defend herself from accusations that she never actually went on the space voyage depicted and she asserts she knows it happens because she believes it happened, although she can offer no proof. If the film had genuinely ended this way, with neither the audience nor Ellie really knowing if the space travel had actually happened, the film would have been much better off. Unfortunately, the movie didn't stop with that. One scene near the end shows a couple of government muckity-mucks played by Angela Bassett and James Woods as they discuss some information in a "secret report". It seems that although Ellie's camera didn't film anything during her alleged trip - which lasted only seconds "Earth time" - the tape showed 18 hours of nothing. The filmmakers seem to believe that this is nothing more than a little bit of intrigue, that the essential question of "did she or didn't she" remains unanswered, but I don't see it that way. The fact her camera ran for 18 hours, despite the appearance that it should have only been on for a few seconds at most, says to me that she definitely did go. I think that Zemeckis may have wanted to leave things vague but that he chickened out. He may not have wanted to leave audiences with the thought that their heroine was a crackpot who hallucinated the whole thing. Without explicitly spelling it out, he seemed to want to make sure that the viewer knows it did happen. Anyone who hopes that the three - count 'em! Three! – audio commentaries will shed some light on this and other issues will be pretty disappointed. Yes, the ending is discussed, but not in any kind of illuminating way. Everybody seems to think it's very vague and they don't seem to feel that it leads the audience to think one way or the other. Obviously, I disagree; whether they intended it to do this, I feel the ending clearly leads the viewer to believe that Ellie made the trip. While I clearly am not a huge fan of Contact, I will acknowledge that despite it's bloated length, it does muster up some interest at times. As with Forrest Gump, Zemeckis can falter but he's simply too talented a filmmaker to truly fall. Probably the most effective aspect of this film revolves around its use of media to tell the story. Zemeckis spends a great deal of time focussing on the TV as a part of society. Many events are depicted through TV reports that are simply filmed right off of a TV screen. This method is not new for him - he used TV and radio as active participants way back during his first film, I Wanna Hold Your Hand - but it probably works more effectively here than previously. The use of everyday media to tell the story adds a tremendous degree of realism to the picture. If such an event actually happened, clearly most of us would experience it through TV news, so the integration of that media into the story greatly helps us suspend disbelief. Contact appears in an aspect ratio of approximately 2.35:1 on this single-sided, double-layered DVD; the image has been enhanced for 16X9 televisions. Much of Contact looked pretty good, but some minor problems kept the transfer from greatness. Some of the issues related to sharpness. Though most shots seemed accurate and well-defined, occasional bouts of softness appeared. These were rare but they created some distractions. Jagged edges and shimmering were minor, and only light edge enhancement could be seen. Source flaws were a periodic issue. I noticed sporadic examples of specks, grit and marks through the movie. These weren’t heavy but they seemed more prominent than expected. Colors looked strong. The movie went with a lively palette that always seemed concise and well-developed. Blacks were dark and dense, and most low-light shots appeared fine. However, some shadows were a little too thick; these didn’t occur frequently, but they caused some slightly unappealing shots. In the end, the movie looked good enough for a “B-“ but it could use a new transfer. No such problems came with the Dolby Digital 5.1 soundtrack of Contact. Though not a constantly active mix, the audio came to life well when necessary. Actually, the flick started with a bang, as the initial journey through the galaxy created an intricate mix of source recordings. From there, the scenes with the Vegan transmission and the spacecraft fared the best. These used all five channels to create a vivid, involving setting. Elements were appropriately localized and meshed together well to form a solid impression. Audio quality seemed very good. Some looped lines distracted, but speech was always concise and natural. Music seemed bright and dynamic, and effects worked well. They showed nice highs and deep lows. The louder scenes packed a serious impact that made them quite impressive. This was a terrific mix that merited an “A-“. In terms of extras, the main attraction here comes from all the DVD’s audio commentaries. We get three of them and start with a discussion from director Robert Zemeckis and producer Steve Starkey. Both men sit together for this running, screen-specific piece. They discuss the opening shot and other visual effects, cast and performances, camerawork and cinematographic issues, music and audio, story and the adaptation of the original novel, set design and locations, and a variety of additional issues. Despite the breadth of the information covered, this never becomes a particularly great commentary. It tends to move a little slowly, and we find too much dead air. Still, it does get into a good array of topics, so as long as you prepare yourself for some dead spots, it merits a listen. For the second track, we hear from actor Jodie Foster. She offers her own running, screen-specific discussion. Foster goes over character and performance issues, themes and story, working with Zemeckis and dealing with technical elements, her co-stars, locations and other production topics. While Foster never turns this into a captivating piece, she does okay for the most part. She comes across as nicely introspective and thoughtful, though I must admit she can frustrate at times. Foster doesn’t dig too deeply into her performance choices; she stays with more superficial acting notes. I’d like to hear more about why she did what she did and less about bumps and bruises. Still, we get a reasonable amount of good information here despite a moderate amount of dead air. Finally, we get a track with senior visual effects supervisor Ken Ralston and visual effects supervisor Stephen Rosenbaum. Both sit together for their running, screen-specific chat. To the surprise of no one, they primarily discuss the various visual effects that appear in the film. We learn many details of these as well as some related production subjects. Surprisingly, I found the commentary from effects guys Ralston and Rosenbaum to be the most interesting of the bunch. They were the wittiest and most engaging of the participants. Unfortunately, if you listen to these tracks in the natural order, this one comes last, which means that you'll already know much of the material they tell you. Yes, three tracks of commentary means a very high level of redundancy. Many facts are repeated on each track; for example, each participant tells us that Jenna Malone, the actress who plays young Ellie, has brown eyes that needed to be artificially colored to match those of Foster. This is interesting to know, but not to hear three times. Anyway, taken on its own, the effects commentary proves useful. It's a good thing that Ralston and Rosenbaum were engaging, because we hear a lot more from them in the other supplements. Under The Special Effects, we find four segments that comprise 40 minutes, 51 seconds of footage and depict various aspects of the special effects. We get “The Making of the Opening Shot” (20:02), “The Making of the NASA Machine Destruction” (5:51), “The Making of the Harrier Landing” (8:53), and “High Speed Compositing Reel” (6:05). These shows us scenes in varying degrees of completion and come accompanied by narration from Ralston and Rosenbaum. They remain entertaining, but this section is somewhat dry. If you’re interested in effects, though, these offer solid tutorials. The final word on the effects comes from a brief section called Computer Animated Concepts. This also comes as raw footage along with narration, this time from 3-D computer graphic artist Tim Wilcox. We find three clips: “The Machine Fly-By” (1:33), “Hadden’s Plane” (0:27) and “NASA Control Room” (0:23). As with the prior components, these can be dry, but they offer good information. The DVD also includes a few text screens of production notes that offer a little more information about the origins and non-technical aspects of the film. These split into four areas: “From Novel to Screen”, “Creating a Fantastic Event”, “The Message…” and “Constructing the Pod”. Finally, we get the standard cast and crew bios, and two trailers. Though it doesn’t always succeed, Contact provides an above-average piece of science fiction. It manages something more thought provoking than usual and works fairly well, though it remains too darned long. The DVD presents decent picture as well as excellent audio and some good extras. This turns into a solid release that holds up well despite a few visual concerns.